The White Banded Awl is rare in Singapore, and is usually associated with the forested nature reserves, rather than urban parks and gardens. It is a fast flyer like most of the "Awls" and appears in the early morning hours of the day, zipping and feeding at damp concrete or stone walls and wooden structures in the vicinity of the nature reserves. 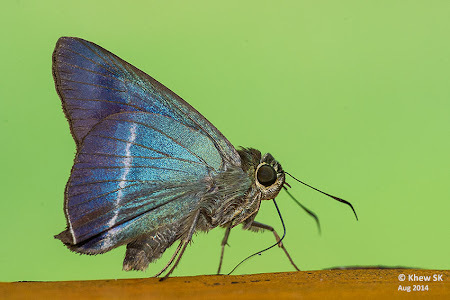 In the later hours of the day, it is usually found in deep shady forests where it has a tendency of perching upside down under a leaf, with its wings folded upright. This individual was encountered much later than usual in the morning, after 10am, perhaps due to the overcast and cool weather last Sunday. It was flying rapidly under the sheltered pavilion at Upper Seleter Reservoir Park, and stopping frequently to feed on some spilt fluids on the concrete table. Note the narrow white post-discal band and the iridescent bluish-green wing bases on both wings, which are diagnostic identification features of the White Banded Awl.